I can count three times in my illustrious climbing career where being ignorant of my climb has helped me with a huge mental and/or physical block in my climbing. The top of my first 5.10 sport lead outside. Completely accidental. The first came when I was a budding 5.8 sport leader 3 years ago. That is, I could fearfully lead a 5.8 outside while I was utterly dominating 5.10’s and 11’s in the gym….on top rope. But nevertheless, I had enough experience clipping bolts, cleaning anchors, and rappeling that I decided to take the cheapest vacation possible to a place that had an extremely high concentration of modern, safely bolted sport routes: Red Rocks Canyon. The long story is included in that trip report. The short story is that I roped up for what I thought was going to be a 5.8 or 5.7 and only later learned once I got down that it was actually a 5.10. Holy crap! I led a 5.10 outside and had NO idea. I went on to lead the next 3 or 4 or however many 5.10’s there were in that area. I knew I was strong enough at the time to climb 10’s but I most certainly didn’t have the balls. Talk about a breakthrough. Despite having many areas with a lot of 5.8’s to choose from, knowing I could now get on 10’s opened up a lot more options. 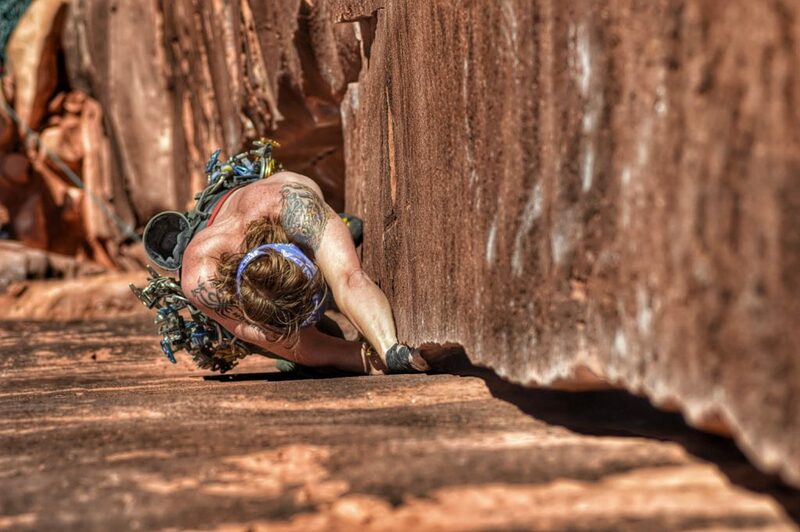 I know more than a couple climbers that get stoked on on-sighting. Personally, I never understood that. I rarely, RARELY ever climb the same area, same crag, or same route more than once. (There are exceptions.) So pretty much everything I lead is on-sight. Well, not everything. I will repeat a sport route on lead, but if the movement doesn’t excite me, I’ll just TR it. I’m not too proud to admit that. Anyways, on-sighting seems to be somewhat of a skill. A skill I’m halfway decent at when climbing within my grade and not pushing it. And that’s exactly how I did two of my first three lead climbs in Indian Creek. I was tired of not leading. I was sick of flailing on top rope. I was gently being pushed by my partners to go for it. And my technique was getting much better. Even still, I had no intention of leading. But then I saw a line. I had no idea what it was. I didn’t look at the guidebook. And I didn’t let anyone climbing with me look at the guidebook. I just saw a nice, hand-sized crack that had some actual crimps on the face if I needed them and low angle foot slabs. That was the first half of the climb. The second half was just a continuation of the beautiful hand-sized splitter crack but only went for about 40 feet. It was calling me. It was saying that this was as good as any line that I’d find if I ever wanted to lead in the creek. So with absolutely no beta and far too many #1’s and #2’s on my rack, I led up my first climb in the creek without any falls. As it turns out, it was some unnamed 5.10, but the rating didn’t matter. The fact that I sacked up and did it, did. And the second one went similarly. It was the next day, and I was feeling destroyed from all the climbs the day prior. We went to the Cat Wall and while other people were off looking for specific climbs, there was a line directly in front of me. Staring at me. Calling me. YELLING at me. Once I racked up, someone started reading the beta from the guidebook. I insisted they shut-up. I didn’t want to know what I was getting myself into. Whether it was a 5.8, 5.10, or 5.12, I didn’t care. The line looked good, I wanted to do it, and worst case scenario, I had volunteers to clean it if I had to bail. It had a short, thin fingers area at the bottom that took two C3’s before getting up to a huge ledge. From the ledge, you got one Camalot #1 way back in an off-width section that lasted for 15 feet. After that, it was another pristine hand-crack eating perfect 1’s, 2’s, and a .75 or two for 40 feet or so. Once I got down, I finally looked at the book and it was another unnamed 5.10. But the badge of honor that came with this route is that everyone else that TR’d it exclaimed how it was such a heady lead, and that they wouldn’t have wanted to lead it. The thin fingers were thin. I think it was a 000 and 0 C3. The offwidth section was going to be a runout cheese grater or some broken bones if you fell. But because I decided to remain ignorant from the start, I didn’t know of any of those dangers. I didn’t psych myself out. My choice once I got started, and especially once I got to that first ledge, was simply to finish the route. Immediately after my breakthrough at The Creek, I went home to WI to build my van. I was gone for a month. I didn’t climb for a month. I met up with a friend at a climbing gym in Minneapolis on the way back. I climbed 5 routes and didn’t flash any of them. I had at least one take, many times multiple takes, just to make it to the top. Not because of fear. Not because of strength. Not because of skill. But because of endurance. It was gone. All gone. When I say 5 routes, I mean the last route I did that night was a 5.8 jug fest, and I still needed a break. So when I got the bug to go climbing last night, I was still a little hesitant. I knew I was the rope gun. I knew I would be the one leading every pitch. But how the hell was I going to do that when I was so terribly out of shape? That didn’t matter. Once again, I had no idea what that route actually went at or what the name of it was, but I could see up to the anchors and thought, “yup, that’s easy.” And it was, with what I thought were one or two 5.10 moves. As I was anchoring in to set a TR, I yelled down to my belayer that it kept going. She asked, “well, should we do it?” With no knowledge of what was above me, other than what I could see from my stance, I agreed. What was seen and what was climbed were two entirely different things. It all looked good from the first belay stance, but once I got on route, everything that looked good turned into downward facing slopers and horrendous crystally side-pulls. I took two whippers on the same move and needed a couple more takes after the crux. Nevertheless, I still made it to the top without “cheating” or aiding. It wasn’t until I got down that I realized I was either on Out of Time or Convolution. Mountain Project doesn’t do a good job of pointing it out in a picture or the route descriptions, but it was definitely one of those two and they both go at 5.11. Had I known it was going to be a 5.11, I would have never tied in. I would have never tried. Because the highest grade I’ve ever led in my life outside was a 5.11- during one of my peak climbing cycles, much less coming off month long break and added weight from mom’s home cookin’. As they say, ignorance is bliss. First off, I have nothing against free soloing. That’s your choice and your life. I might be sad and devastated and decide to quit climbing if you’re my best friend and kill yourself free soloing, but at least I’m the one that’s still alive. At this point in my life, I won’t purposely walk up to a climb with the intent of free-soloing. When I rope up for a 5.4 or 5.5, I have every intention of placing gear along the way. But sometimes it doesn’t take gear very well. Sometimes looking for a placement takes longer than just going. And I do have the ability to block out fear, to not think, and to just be lasered into my climbing and technique. I’m strong. I’m confident. It’s just one hold after another. And before I know it, I’m at the chains. Or I’ve run out 20′ between pieces. 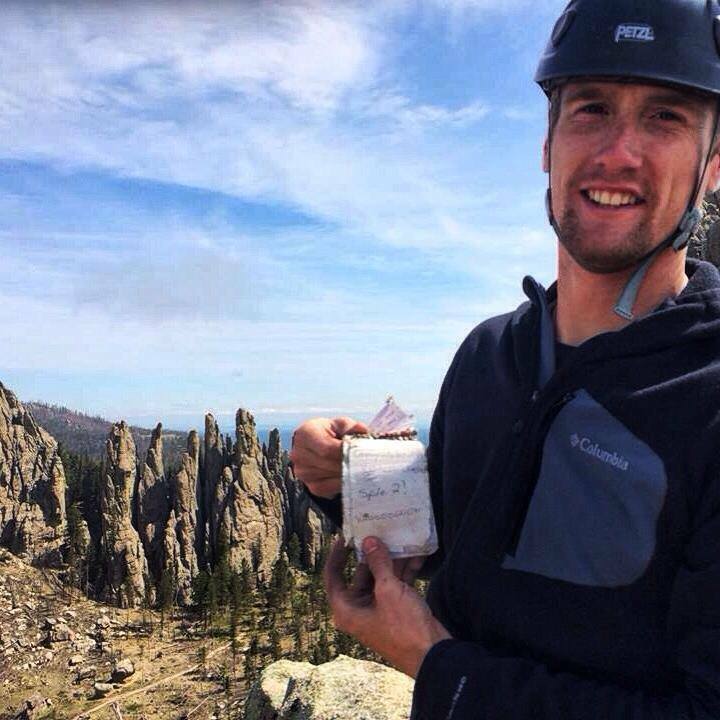 I accidentally free-soloed the first two pitches of Spire 2 of the Cathedral Spires in the Black Hills last summer. But I never do it intentionally. It’s starting a route and knowing you have absolutely no security. No way of getting yourself out of trouble (other than down-climbing, which is 3,904,3w4,034 times worse that up-climbing). You know that from the start, and you know you’re dead (or wished you’d be dead) if you fall after the first 40’ish feet. When I accidentally free-solo, I at least have a rope. I have gear. I have a belayer. I have a way to rescue myself. It’s true, I may be running something out and then freak out and not have any placements. At that point my fate is the same as someone that purposely free-soloed if I can’t calm down and find my headspace again. But in my experience that hasn’t happened a lot. There is usually a place for gear. Or I’m smart enough to know that I have to place gear. But the main reason I don’t run into that problem is because I only do it when I know for a fact the climb is at least 3-4 grades or more below my level. So if I do end up free-soloing something, it’s not because I’m ignorant. Nor do I believe a purposely free-soloed climb is ignorant. But as I’m climbing those lesser graded routes, I do choose to remain ignorant on the consequences should I accidentally fall. As you can see, there are many instances in climbing where ignorance is bliss. 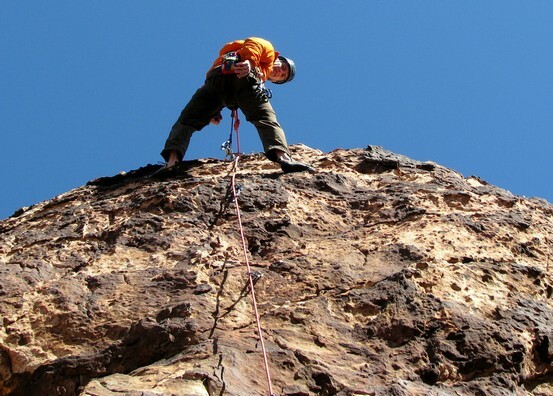 Whether you’re holding yourself back mentally, or you’re just not willing to try climb a harder route because you don’t think you’re strong enough, not knowing, or remaining ignorant of that route’s grade can push you to the next level. Or give you the confidence you were lacking. Where ignorance cannot be tolerated is in safety. Not just your safety, but your belayer’s as well. If you have never climbed outside and just do internet research before setting top-rope anchors, that’s ignorant. If your true limit is 5.10 and you try to on-sight a 5.10X route, that’s ignorant. If you top-rope solo or lead solo with never having seen it done or talked to someone about it in great detail after already having a ton of regular experience, that’s ignorant. Ignorance in these situations can easily get you killed. Or your belayer. And if you kill your belayer because of your ignorance, I guarantee you’d wish you were dead too. So there is a time and place for ignorance in climbing. It can help you overcome your fears. It can give you the confidence to push through to the next grade. Or it can kill you. Be safe and use it wisely.